Above you can see a truly spectacular error, a 2001 Australian 20 cent struck on a bi-metal planchet. Wrong or foreign planchet errors are at the apex of desirability for Australian error collectors, and errors like this coin that are so obviously wrong are the most wanted of the bunch. Struck on a 10.66g planchet with a nickel or copper-nickel core surrounded by a brass or aluminium bronze ring, this 2001 20c is not the first error of this type sighted. That honour belongs to an example that appeared in 2007 Downies Auction where it sold for about $3500. 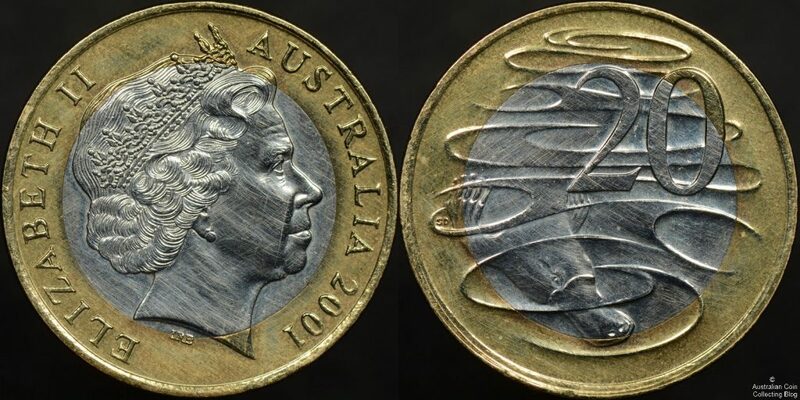 The example you can see above surfaced this year and was the subject of an article of an article in the September 2017 Edition (page 10) of the Australasian Coin and Banknote Magazine. It then appeared in Downies Auction 325 (lot 1785) where it was incorrectly described as the discovery coin from 2007. The coin sold for $8000 plus commission of 20% in that auction. The coin has been wiped (cleaned) sometime in the past, with the very first images of the coin posted online in early 2017 by the original owner clearly showing the cleaning applied by some mis-guided individual trying to ‘improve the coin’. How does this type of error occur? So called ‘blank contamination’, where coin blanks of one type inadvertently contaminate the supply of another type. This could happen at the source of the blanks, which in this case was likely to be a company in South Korea. That company makes hundreds of different types of coin blanks and it’s not to difficult to imagine that every now and again a blank of one type could end up contaminating the supply of another type. For example, in the the Australian $1 coin on a bi-metal planchet was a result of that sort of contamination. Alternatively it could happen at the mint of origin when blanks of one type of coin minted contaminate the blank supply of another. For example, this 1944s florin on a shilling planchet, struck in San Francisco when the US mint was manufacturing both Australian florins and shillings (and threepences for that matter). One of the two major Australian coin catalogues mentions the discovery piece for this error where it’s vaguely described as being struck “on a blank for a foreign customer”. We’ve got a more firm opinion having conducted a survey of all bi-metal coins from the 2000 and 2001 periods. The only coin which matches the specifications of the blanks these errors were struck on is KM#1262 , the Iranian 250 Rials. That coin weighs 10.7g, with a brass ring and a copper nickel core. It’s more than likely that blanks for the 250 rial coins of the period are the source of the blank that these amazing bi-metal errors were struck on.